The US Senate has approved the construction of fencing along the southern border with Mexico. The move forms part of an immigration bill being discussed by senators, who also backed a plan to allow illegal migrants a chance at citizenship. Hundreds of campaigners gathered in Washington to lobby senators. Correspondents say the Senate vote largely follows the outlines of President Bush's speech on Monday, in which he proposed immigration reforms. Mr Bush sought to appease both conservatives and pro-immigrant campaigners, proposing the creation of a "path to citizenship" for illegal incomers, along with steps to bolster border security. On Wednesday, the Senate acted along similar lines, voting 83-16 to back the construction of 370 miles (595 km) of triple-layered fencing at strategic points of the southern border. "By passing my measure, we are sending a signal that we are serious about stopping the flow of illegal immigrants over the border," said the amendment's author, Senator Jeff Sessions. He said US regions where barriers already exist have experienced lower crime and a stimulated economy. Opponents of fences say they increase deaths among desperate would-be immigrants, who must travel to more remote areas to try to cross. The measure also calls for the installation of vehicle barriers on a 500-mile stretch of the 2,000-mile border. By 66-33 votes, the Senate threw out a proposal that would have removed provisions allowing illegal immigrants the chance to gain citizenship - although it blocked illegal immigrants with criminal records from becoming citizens. Senators also approved the creation of a guest-worker programme similar to that put forward in President Bush's Monday speech. Immigration reform activists from more than 20 states tramped the corridors of the elegant Senate building all day, reported news agency AFP, lobbying senators ahead of the vote. Up to 1,000 demonstrators later gathered on Washington's National Mall, to emphasise the value of immigrants to the United States. The final shape of immigration legislation is not yet definite, as the Senate proposals must be reconciled with measures backed by the House of Representatives. 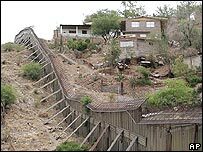 The House has approved a much tougher bill, which makes illegal entry a crime, gives illegal immigrants no options to become citizens, and proposes the construction of fencing twice as long as that backed by the Senate. There are reported to be about 11.5 million illegal immigrants in the United States, and each year some 500,000 to a million more enter the country, mostly via the border with Mexico.